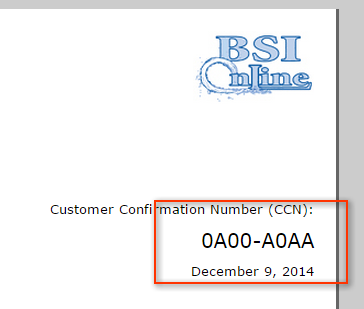 Your Customer Confirmation Number (CCN) is located on your letter near the upper right hand corner. Want to know if your backflow test has been submitted? Enter your Customer Confirmation Number (CCN) below and we will look through our records for you. If we cant find a test for your property, provide us with your email address and we will email you when one is submitted. Looking for a Testing Company? Enter your Customer Confirmation Number (CCN) below and we will show you licensed backflow testers in your area. Note BSI Online does not perform the actual backflow testing - as we are simply administrative agents on behalf of your city. Want to know more about backflow? FAQ Page . We were unable to find a test entered for your property. If you have had your testing done, its possible the contractor has not yet filed your test. If this is the case please contact your contractor. Please enter your email if you would like to be notified when your test is entered. We have received some of the tests for your property, but there are assemblies that still need to have their test submitted; these assemblies are listed below. Test reports for all assemblies at your property must be submitted by your contractor in order for you to be considered compliant. Otherwise you are subject to enforcement by the municipality. If you would like to be notified by email when your test is entered, provide us with your email address below. We have received your test results. Below is a list of the devices and whether they passed or failed. If in the future you would like to be notified when a test is submitted for your property, provide us with your email address below.